Llangewydd Junior School in Bridgend has recycled an old Urdd Eisteddfod exhibition stand for storytelling, art classes and science lessons. 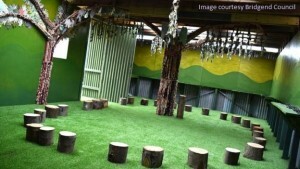 With Astro turf ‘grass’ on the outside walls and fabric ‘trees’ inside, Llangewydd Junior School’s brand new outdoor classroom is the perfect place for learning about the environment! Inside the new outdoor classroom there is a log circle. The indoord ‘trees’ are covered with 350 leaves made out of pupils’ and teachers’ hand-prints hanging from the tree branches. The Mayor of Bridgend County Borough officially opened the new classroom this week, and Head teacher Sue Davies said: “We are extremely excited about our new outdoor classroom, which is the first of its kind in Wales. Recycling has become an extremely important issue for the exhibitions industry. Huge volumes of material are simply thrown away every show; carpets, graphics, leaflets as well as entire exhibition stands. Our own range of modular exhibition stands are designed to be re-used multiple times. Configurable for any floor space or ceiling height, our solutions enable organisations to minimise both wastage and their own carbon footprint. This is why we’re extremely pleased to hear about projects such as this. Well done to Urdd Eisteddfod and Llangewydd Junior School for coming up with this fantastic idea! If you have an old exhibition which you would like to see re-used for a similar project, we would love to hear from you. Get in touch with 200m2 Exhibitions if we can help in any way. Next Next post: The largest number of exhibition stands in one place!